After a busy end of the year at work I am glad to say that work has died down a little bit and this means I now have more time in the garden. I spent a pleasant day gardening last Sunday as the weather was Spring like. I have Crocuses starting to flower which is always a welcome site. 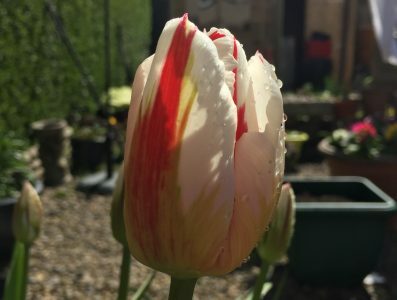 I have moved all my Tulips into a more sunnier position and gave the garden a bit of a tidy, but not that much of a tidy as you need to leave messy bits for the wildlife. Weather wise it is still very dry. I know it is Winter but to my over active brain the climate does seem to be getting more drier. Cold weather started on Thursday but it is really nothing to write hone about. No doubt I will be moaning in the Spring about the torrents of rain we are having! This Aeonium cross is one of the hardest out there. Hardy down to -8 degrees this has been a nice addition to the collection. Will look forward to see foe this recovers in the Spring. I bought 2 different Sisyrinchiums over Christmas and they were delivered last week. They are Devon Blue and Biscuttella. I have potted them into a bigger pot and will plant them in the garden in the Spring. Sisyrinchiums are native to North America and a member of the Iris family. They produce masses of small beautiful flowers. Usually small forming you can get taller growing plants and I have Sisyrinchium Aunt May in the garden but it didn’t flower last year. As I mentioned last week I am planting up 3 more dry troughs. This is the first one that I planted up last Sunday. This one has Aeoniun Cornish Pixie, Aeonium Decorum, Aeonium Leucoblepharum, and on the top left is a Orostachys Bohemeri (Chinese Dunces Cap) although it has seem to have taken on a strange colour and is a little bit elongated but this is probably due to the lack of sun. The little seedling I think is a Lewisia although I am not 100% sure as I lost the label and I showed them 18 months ago. This dry trough includes 4 Sedums and on the right Saxifraga Whitehills. From the bottom right we have Sedum Hispacium, Blue Spruce. Coral Carpet and Dasyphyluum. In the middle is Evherveria Black Prince. I am taking a bit of a rick leaving this Echerveria out in the open during the winter. Nothing ventured! A nice Sedum with lustrous green leaves that tips turn red. This Sedum has not see. Very much sun over winter hence it has become a little bit stretched. I have just. I have been about this and it is more hardy than I thought. Might have to put this one back out in the garden. I did not take enough photo’s during daylight hours this week so had to take this hastily at 5.30 this morning before work. The plant actually looks more healthy than this photo looks. It should turn a more darker green when it starts to get more sunlight. That is my SOS. It’s a working weekend for me this week so unfortunately gardening will have to take a back seat. Aeonium ‘Ice Warrior’ is a great name – hope it does what it says on the tin! This aeonium is interesting for our temperatures … I should take a look at this species later. About the stone trough, did you drill a lot of holes before planting or just one in the center? I have to find one and create a new alpine garden. I have experimented. I have drilled one whole in one and 3 in the other. My question wasn’t so stupid. Wait for your conclusions now. I do love these dry troughs and surprised the plants are surviving the frosts. We haven’t had really had any big frost’s. I live on the coast so don’t get many severe ones. It is sometimes hard to juggle everything isn’t it. Still your dry troughs looks great, and will I’m sure only get better and better. The hardy aeonium looks very interesting, one for The List I think! Thanks. Yeah that Aeonium is certainly interesting. More updates to follow. The Sedums in my troughs continue to look good with no attention from me. I am very happy with them but yours are most interesting. I won’t ask how many different varieties you have, I am sure it’s mind boggling!! I would love to have some of those dry troughs! Did you make them? I love the name “Ice Warrior.” That says it all, don’t you think! All your plants look very good! Of really! What a bargain and they are soooooooo nice! Here they are hundreds of dollars at the garden centers! Oh don’t get me wrong for some of the old cattle and horse troughs that you can pay thousands across here. These were just cheap concrete. Or a horse or cattle trough would be exceptional! That’s much what I was thinking on the weather – it seemed like a long time since we had any decent rain, until yesterday evening. I love the dry trough ideas. All my succulents are in individual pots, but your dry troughs look so much better! Thanks yes the dry troughs seem ti do really well. Give them a try! Your Saturday starts before ours does. I am way behind schedule. Yours is the second one I got to, and I only got the other by skipping ahead. That blue eyed grass looks odd in a pot. I am used to seeing them in the green waste recycle pile. They do well in the wild, but they get too much water in the landscape. I think they are a great idea here, if only the so-called ‘gardeners’ would not waste so much water o them.